2) A Fed on hold in 2019 whereas we expect 25 to 50 basis points in the second half of the year before a pause for 2020. 3) Trade negotiations between the US and China continuing into the second quarter. This could lead to sporadic periods of volatility. With a Federal Reserve likely on hold almost till 2020, the natural tendency is a search for yield far and wide from developed to emerging markets. European credit spreads are tight, whereas US investment grade spreads are likely to be compressed. There, the concern is on clusters of names that are highly leveraged. Fears of lower growth have forced some names to deleverage, but it is early days. Note also that high yielding oil companies are a concern should oil prices plunge again for an extended period of time. Historically, we know that the S&P 500 should do well in the current and future environment. Looking at the line for the S&P500 in Figure 1, one sees that in a normal volatility environment when the Fed is on hold, the returns are 2.2% over a ten-day period and statistically significant (bold). In an environment where the Fed is easing, there is no clear result and when it is hiking, the returns are 3.5% over 10 days—our scenario for the second half of the year, though clearly not that of the market. In the case of a bout of extreme volatility, VIX above 30, the S&P500 loses 3.6% over three days and if it lasts longer, the only thing one can conclude is that credit does badly. The question is whether we are in a long-term positive trend for US equities. That depends on the labor market not over-heating which means that more of the gains of growth will accrue to equity owners than households. This assumes also that leverage does not build to such an extent that the carry trade collapses. That depends on regulation; non-financial corporates being partly free of such shackles. Hence, we can say that the trend for US equities is positive, but that collapses in the carry trade are possible albeit not our core scenario. In a low volatility environment, the search for yield benefits emerging markets but is not universal as fundamentals, valuations and technicals play a role. This suggests a managed approach as fundamentals can be somewhat toxic primarily in Turkey (Central Bank independence, inflation, fiscal and current account deficit), Russia (sticky inflation) and South Africa (blackouts, current account and fiscal deficits). What you are left with are valuations and technicals. On these metrics, emerging markets equity valuations outside of India are neutral to cheap (see figure 2). If you look at the chart, you can see that Emerging Market equities are broadly cheap with -1, meaning that P/E is one to two volatilities below its average. Two key data points are Indian equities which are very expensive and Chinese equities which are quite cheap and attractive. Technicals, in the sense of flows and price dynamics, show a rally with few inflows of foreign capital. As the search for yield continues, belatedly buoyed by a more optimistic view on US growth, foreign capital should return helping Emerging Market currencies to some extent, but emerging markets debt and equity to a much greater extent. Continued PBOC easing should help the Chinese economy to rebound in one or two quarters. For example, we expect further cuts to the Required Reserve Ratio which has plenty of room to the downside versus history (see figure 3). This will help the balance sheet of banks leading them to lend more while origination rebounds. At the same time, the PBOC is likely to find ways to inject equity into its banking sector, though not wholesale as it did in the 1990s. Trade negotiations while not a straightforward process should help dispel the gloom of what are cheap domestic equities and bonds—they are cheap for a good reason (we expect balance sheet issues and slower growth will improve). 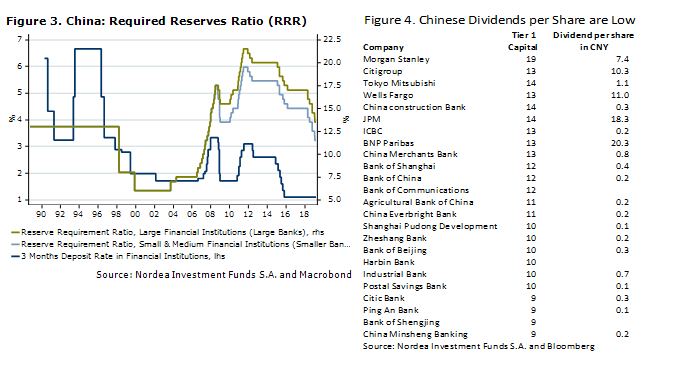 To see the balance sheet problem, look at the dividends paid by Chinese banks (see figure 4). For example, the national Zheshang bank offers an 0.2 CNY dividend per share. One can see that Chinese global and regional banks offer a very low dividend yield per share relative to global western banks. As the ability to pay a high dividend is a strong sign of a healthy balance sheet, it is clear from this that some Chinese banks, likely regional ones, have issues with the quality of their on and off-balance sheets. This then implies that parts of the Chinese corporate world, to which banks are exposed, also have balance sheet issues. Regarding trade negotiations with the US, whereas optimism is de rigueur, the reality is that there is still a chance that the US walks away. As the US stated it would keep tariffs for a while, the odds of a deal are very decent as they have a credible threat. In such an environment of cheap valuations and eventually recovering growth, Chinese fixed income and equities as well as APAC – some caution on South Korea – are attractive, particularly so as Chinese equities are being integrated more firmly into global equity indices. We expect the Fed to stay on hold in Q2 before hiking once or twice from June forward followed by a pause due to the US elections, however the Fed has signalled a pause into 2020. The Fed can afford to wait and see the impact of past tightening as inflation remains tame even with a tight labour market. The Philips curve, namely the relationship between unemployment and inflation, has been broken for a while most likely because part of the labour market is global. For example, if an IT company doesn’t want to pay higher prices, it can import from a more plentiful source. The Fed sticks with the concept that a very low unemployment rate eventually translates into higher inflation as this is common sense. While we can’t prove that the Phillips curve works for a lack of data, this doesn’t negate its existence in the extremes. Hence, we expect the Fed to eventually tighten monetary policy in anticipation of higher inflation. The Fed on the other side stresses its inflation target and is on hold. 6) Oil prices are likely to stay at subdued levels on the back of US shale supply. At some point, though, the Fed will judge that the labor market risks being so tight that wage pressures will increase rapidly and feed into higher inflation. This probability increases month after month as long as the economy continues to grow at a slightly subpar rate. The Fed will then have the choice of a pause, running behind the curve or hiking more than expected by the market and then staying on hold. In the second case, one- to two-year sovereign yield will be higher than longer dated yields. In the third scenario, both short-dated and longer-dated yields move higher together. Currently, neither the second not third scenario is expected. The second quarter should hence see the US sovereign curve oscillate between these competing theses suggesting active management. 1. Missing or misjudging factors. While we can deduce that trade negotiations have been an important factor for Chinese equities, what is likely missing is the actual size of the non-performing loan market. It must be large on the off-balance sheet positions of banks, especially regional ones. What is also missing is coherence between a fixed income market bearish on growth and a bullish equity market. Typically, such a joust ends up in favour of fixed income. Our thesis is that fixed income may eventually be right in 2020 heading into 2021. 2. Misjudgement of the importance of each factor or forgetting some. Within our thesis, the importance has been placed on China and the United States, yet there are idiosyncratic events in emerging markets. We have also completely ignored political and legal risks. 3. Underestimating how forward looking the market is. The wisdom is that the equity market can anticipate up to three quarters and the fixed income market, with fewer variables, up to three years. 4. An inherent bias such as a tendency towards risk aversion. Risks to our thesis should be seen from a neutral point view, but rarely are, hence the focus on metrics. We are constructive on emerging markets bonds and equities as well as developed market equities on the presumption that the Fed stays on hold at least in Q2 (2020 for the Fed) to then tighten a tad. From a pure valuation point of view, EM and to a lesser extent DM equities are not particularly expensive. From a practical point, active asset allocation is likely a good idea with, for example, the long end of the USD/Turkish curve is completely mispriced. Note: This is a NAM macro view, not the official Nordea view. Nordea Asset Management (NAM, AuM 204.8bn EUR*), is part of the Nordea Group, the largest financial services group in Northern Europe (AuM 282.6bn EUR*). NAM offers European and global investors’ exposure to a broad set of investment funds. We serve a wide range of clients and distributors which include banks, asset managers, independent financial advisors and insurance companies. Nordea Asset Management has a presence in Cologne, Copenhagen, Frankfurt, Helsinki, London, Luxembourg, Madrid, Milan, New York, Oslo, Paris, Santiago de Chile, Singapore, Stockholm, Vienna and Zurich. Nordea’s local presence goes hand in hand with the objective of being accessible and offering the best service to clients. Nordea’s success is based on a sustainable and unique multi-boutique approach that combines the expertise of specialised internal boutiques with exclusive external competences allowing us to deliver alpha in a stable way for the benefit of our clients. NAM solutions cover all asset classes from fixed income and equity to multi asset solutions, and manage local and European as well as US, global and emerging market products.